TRPV1 channels are gated by a variety of thermal, chemical, and mechanical stimuli. We used optical recording of Ca2+ influx through TRPV1 to measure activity and mobility of single TRPV1 molecules in isolated dorsal root ganglion neurons and cell lines. The opening of single TRPV1 channels produced sparklets, representing localized regions of elevated Ca2+. Unlike sparklets reported for L-type Ca2+ channels, TRPV4 channels, and AchR channels, TRPV1 channels diffused laterally in the plasma membrane as they gated. Mobility was highly variable from channel-to-channel and, to a smaller extent, from cell to cell. Most surprisingly, we found that mobility decreased upon channel activation by capsaicin, but only in the presence of extracellular Ca2+. We propose that decreased mobility of open TRPV1 could act as a diffusion trap to concentrate channels in cell regions with high activity. Cells rely on proteins called receptors to keep them informed about what is going on around them. These receptors, which are embedded in the surface of the cell, detect and respond to specific chemical signals. It is known that receptors move around the cell surface as they search for particular chemical signals, but these movements have not been widely studied in experiments. Senning and Gordon have now investigated the movements of receptors called TRPV1 channels that can detect a chemical called capsaicin. This receptor contains an ion channel that is usually closed. However, when the receptor is activated this channel opens and allows calcium ions to enter the cell. In the experiments the receptors were tagged with a fluorescent marker, and a fluorescent calcium dye was used to indicate when the channel had been activated by capsaicin. This allowed the function of the receptors to be followed in real time. The experiments were performed on nerve cells taken from mice and in cell culture lines derived from neurons and kidney cells. Senning and Gordon showed that at first the receptors moved around freely on the surface of the cell, with the degree of mobility varying from cell to cell and also from receptor to receptor. However, when a receptor detected a capsaicin molecule and opened, it tended to move more slowly when calcium ions were present outside the cells. Further research is needed to explore the mechanism that prevents the receptor from moving. However, since calcium ions are involved in a wide range of processes in the nervous system, it is thought that this mechanism ensures that the receptors concentrate in regions of high neuronal activity. The transient receptor potential vanilloid type 1 (TRPV1) ion channel expressed in peripheral sensory neurons may be one of the most heavily regulated ion channels known. Its gating is multimodal, regulated by extracellular protons, phosphorylation by PKC, phosphorylation by PKA, temperature, fatty acids such as lysophosphatidic acid and anandamide, phosphoinositide signaling lipids, eicosanoids, and capsaicin, the pungent extract of hot chili peppers (Caterina et al., 1997; Zygmunt et al., 1999; Premkumar and Ahern, 2000; Bhave et al., 2002; Hu et al., 2002; Pomonis et al., 2003; Klein et al., 2008; Ufret-Vincenty et al., 2011; Nieto-Posadas et al., 2012). Furthermore, it is also subject to indirect regulation by G-protein coupled receptors and intracellular Ca2+ and its trafficking can be regulated by receptor tyrosine kinases (Chuang et al., 2001; Zhang et al., 2005, 2008; Stein et al., 2006). TRPV1 channels are highly permeable to Ca2+, with PNa:PCa estimated to be at least 1:10 (Caterina et al., 1997). Indeed, Ca2+ imaging at the whole-cell level was used in the seminal tour-de-force that first identified TRPV1 as the capsaicin-activated ion channel (Caterina et al., 1997). The high permeability of TRPV1 to Ca2+ has also been a useful tool in high-throughput screening of regulatory compounds and led to the identification of a family of toxins, first purified from spiders, that act as potent activators of TRPV1 (and have enhanced the survival of the spiders) (Caterina et al., 1997). In addition, Ca2+ influx through TRPV1 desensitizes sensory neurons (Cholewinski et al., 1993; Koplas et al., 1997; Rosenbaum et al., 2004). Although multiple pathways are likely involved in neuronal desensitization, depletion of the signaling lipid phosphoinositide 4,5-bisphosphate (PI(4,5)P2) via Ca2+-mediated activation of phospholipase C appears to contribute to desensitization of TRPV1 during periods of high channel activity (Stein et al., 2006; Lukacs et al., 2007). 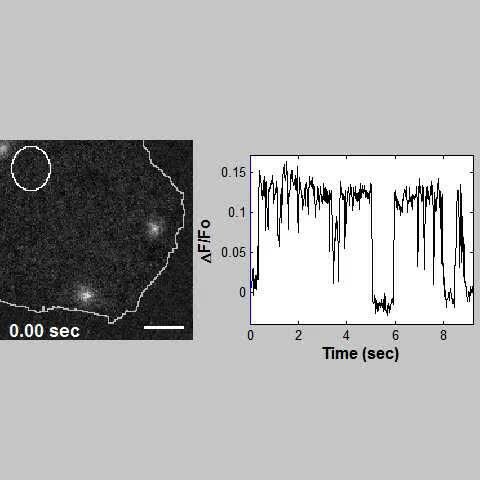 Optical recording of localized Ca2+ influx through plasma membrane ion channels can be achieved using a combination of Ca2+-sensitive fluorescent dyes and non-fluorescent Ca2+ chelators loaded into cells via a whole-cell patch pipette. When Ca2+-permeable channels open, localized Ca2+ influx produces a fluorescent ‘sparklet’ in the cytosol proximal to the active channel (Wang et al., 2001). 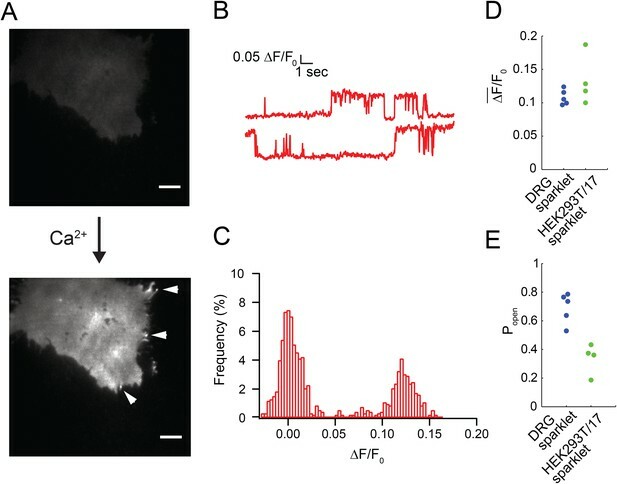 The presence of the nonfluorescent Ca2+ chelator in the cell acts as a sink for the excess Ca2+, enhancing the localization of the source of the influx (Navedo et al., 2005). Optical approaches have been used to record the activity of L-type Ca2+ channels in urinary bladder smooth muscle (Sidaway and Teramoto, 2014), arterial smooth muscle (Navedo et al., 2006; Amberg et al., 2007; Navedo et al., 2010; Tajada et al., 2013), ventricular myocytes (Wang et al., 2001; Zhou et al., 2009), and mammalian cell lines (Gulia et al., 2013). More recently, sparklets due to TRPV4 channels have been reported in arterial smooth muscle (Mercado et al., 2014) and vascular endothelium (Bagher et al., 2012; Sonkusare et al., 2012). Two aspects of sparklets reported from L-type Ca2+ channels and TRPV4 channels are remarkable. First, multiple channels were typically clustered at the sparklet sites. Second, the sparklets remained stationary throughout the observation period. Thus, some mechanism(s) for clustering channels must be operating in these cells. Whether the clustering mechanism(s) and the mechanism(s) eliminating diffusion of the clusters are related is unknown. Most importantly, whether any Ca2+-permeable channels have the capability to gate (open and close) as they diffuse laterally in the plasma membrane of a cell has not previously been addressed. It should be noted that the muscle nicotinic aceytylcholine receptors (AChR) expressed in Xenopus oocytes have also been studied by optical recording, and the fluorescence signals emanating from these channels did not indicate channel clustering at the fluorescence sites (Demuro and Parker, 2005). Nevertheless, the authors did find that all fluorescence Ca2+ signals from AChR maintained a constant position for the duration of the optical recordings. Regulation of mobility in the plasma membrane has been identified as a key element in signaling for the Orai family of Ca2+-release activated channels (CRAC). 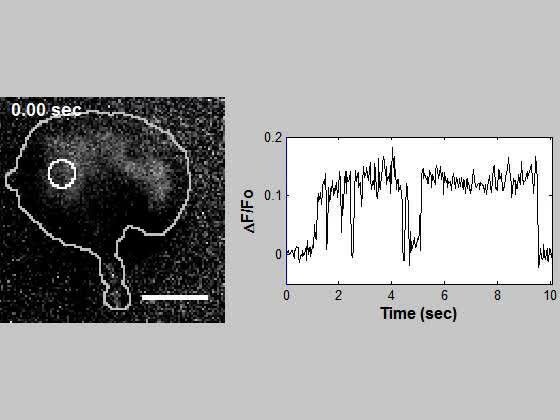 Orai channels diffuse throughout the plasma membrane in resting cells, but in response to the emptying of Ca2+ from the endoplasmic reticulum (ER) they cluster at sites in the surface membrane that juxtapose to the ER (Lioudyno et al., 2008; Penna et al., 2008). The interaction of Orai channels with the ER-resident protein STIM1 reduces Orai mobility, acting as a sort of diffusion trap to localize Orai channels to these sites as well as directly gating Ca2+ influx through the Orai pore (Yeromin et al., 2006; Zhang et al., 2006; Wu et al., 2014). Although the diffusion trap mechanism has not yet been proposed for other types of ion channels, the addition of regulated mobility to a cell's toolkit for controlling its functions represents a powerful means of increasing the spatial and temporal specificity of cell signaling. In the present study we asked whether the mobility of TRPV1 might be regulated and whether any such regulation might be coupled to channel activity. We took advantage of the high Ca2+ permeability of TRPV1 to record Ca2+ sparklets that reflected the influx of Ca2+ through open TRPV1 channels in response to capsaicin in isolated mouse dorsal root ganglion neurons and in immortalized mammalian cell lines. Whole-cell voltage clamp was used to both minimize the signal due to voltage-gated Ca2+ channels and to introduce a combination of fluorescent and nonfluorescent Ca2+ chelators. In contrast to L-type Ca2+ channels, TRPV4 channels and AChR previously studied, Ca2+ sparklets from TRPV1 channels in isolated dorsal root ganglion neurons and cultured cell lines were observed with a wide spectrum of mobilities, from immobile to near the diffusion coefficient of a lipid moving through a bilayer. To our knowledge, the opening and closing of a channel as it diffuses through the plasma membrane has not been previously observed. Using TRPV1 fused to GFP expressed in HEK293T/17 cells, we established that each sparklet represented the activity of one and only one TRPV1 channel. Remarkably, we found that the mobility of TRPV1, whether measured using sparklets or by tracking GFP-fused channels, decreased with activity in an extracellular Ca2+-dependent manner. We propose that activity-dependent regulation of TRPV1 mobility could, like for Orai, lead to clustering of channels in regions of the cell where they are most needed. The intricate regulation of TRPV1 activity prompted us to examine whether TRPV1 mobility would also be subject to regulation. This question arose, in part, from the recognition that the many signals converging on TRPV1-expressing sensory neurons would be distributed heterogeneously across the cells' receptive fields. In addition, new data from other channels indicates that mobility can be a powerful means by which cell function can be regulated. To examine this question, however, required implementation of new approaches that would allow activity and mobility to be measured in the same preparation and in primary sensory neurons. To determine the activity of individual TRPV1 channels, we used whole-cell patch clamp of isolated mouse dorsal root ganglion neurons. TRPV1-expressing nociceptors were easily distinguished as the small-diameter (∼50 µm) cells in a 12–24 hr culture. As previously shown, these cells have large, capsaicin-activated currents when studied with whole-cell patch clamp as well as when studied using inside-out patch clamp (Stein et al., 2006). The fluorescent Ca2+ indicator Fluo-4 (200 μM) and the nonfluorescent Ca2+ chelator EGTA (10 mM) were included in the patch pipette, and cells were held at a potential of −40 mV. This potential was chosen empirically as the potential that minimized Ca2+ influx in the absence of capsaicin. In addition to the EGTA included in the intracellular pipette solution, 1 μM thapsigargin was included in the bath solution to deplete the endoplasmic reticulum Ca2+ stores (see ‘Materials and methods’). These solutions allowed us to attribute the capsaicin-induced rise in intracellular Ca2+ to influx through TRPV1 channels in the plasma membrane. Very little fluorescence was observed upon dialysis of Fluo-4/ EGTA solution into the isolated dorsal root ganglion neurons via the patch pipette. However, subsequent perfusion of 100 nM capsaicin into the bath generated localized bursts of fluorescence, termed sparklets (Figure 1A and Video 1). Sparklets were observed with physiological concentrations of extracellular Ca2+ (2 mM). Out of 12 cells that responded to capsaicin and showed a rise in global fluorescence due to Ca2+ influx, nine cells had easily distinguished local micro-domains of Ca2+ influx that we classified as sparklets. Capsaicin induced sparklets in whole-cell voltage clamped dorsal root ganglion cells loaded with Fluo-4. (A) Images of immobile sparklet (white circle) in dorsal root ganglion cell at time points when inactive (1) and active (2) with corresponding intensity trace below (see Video 1). (B) Moving sparklet recorded for 5.6 s in dorsal root ganglion cell (see Video 2). Inset is of sparklet trace magnified fivefold. Inset scale bar is 1 µm. All other scale bars are 5 µm. (C) Mean fluorescence intensity (ΔF¯/F0) and (D) open probability (Popen) of dorsal root ganglion sparklets (N = 5; 3 cells) in Figure 1—figure supplement 1 A–E. Cut-off for ‘open’ is when intensity (ΔF/F0) exceeds 0.05. Immobile sparklet (white circle) in dorsal root ganglion cell with fluorescence recording on the right elicited by capsaicin (100 nM). Scale bar is 5 μm. Fluorescence intensity analysis of TRPV1 sparklets in isolated dorsal root ganglion neurons revealed two states: a dark state presumed to correspond to a closed channel state and a bright state presumed to correspond an open channel state (Figure 1A and Video 1). All-points amplitude histograms of the fluorescence intensity revealed that sparklet-to-sparklet variability in amplitude of the capsaicin-induced fluorescence was low (Figure 1—figure supplement 1). However, this amplitude is likely determined primarily by the channel's relative position along the z-axis within the TIRF evanescent excitation field as well as the concentrations and properties of Ca2+ buffers used. Thus, we did not interpret the stereotyped amplitude in terms of Ca2+ concentration at the sparklet sites. 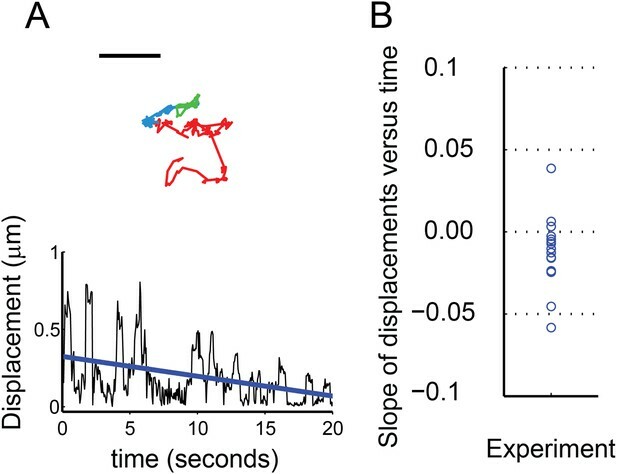 Interestingly, the two-state intensity traces (Figure 1A and Figure 1—figure supplement 1) resemble those of single-channel activity measured with electrophysiology (e.g., Liu et al., 2004; Rosenbaum et al., 2004), albeit with lower temporal resolution. These data are consistent with each sparklet representing a single gating TRPV1 channel or a cluster of TRPV1 channels gating cooperatively. We distinguish between these possibilities below. The all-points histograms of sparklet amplitude shown in Figure 1—figure supplement 1 could be used to calculate the open probability for each sparklet, shown in Figure 1D. We compared these open probability values to those measured from the whole population of channels in these isolated dorsal root ganglion cells using whole-cell patch clamp. 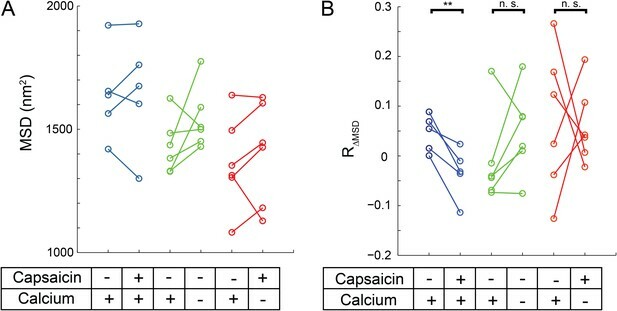 Examining the dose–response relation for activation by capsaicin (Figure 1—figure supplement 2) shows that the current recorded in the presence of 100 nM capsaicin normalized to the current at a saturating capsaicin concentration was 0.84 ± 0.05 (n = 4). This fractional activation value is slightly greater than the open probability values plotted in Figure 1D, for which the mean was 0.7 ± 0.1 (N = 5). This small discrepancy is expected, because the open probability of TRPV1 in the presence of a saturating capsaicin concentration is somewhat less than 1.0 (Liu et al., 2004). These data indicate that the sensitivity of single TRPV1 channels as calculated from optical recordings of sparklets is similar to that of the cell population measured using whole-cell patch clamp. The fluorescence intensity of the sparklet shown in Figure 1A was straight forward to quantify because it was immobile, that is it did not move. However, many of the capsaicin-activated sparklets we observed were dynamic, that is they appeared to move laterally in the plane of the membrane (Figure 1B). In order to follow the high mobility of these sparklets, we recorded their movement at a camera frame-rate of 33 fps. The inset of Figure 1B was made by tracking the indicated sparklet with the Spot Tracker 2D plugin for ImageJ (see ‘Materials and methods’), and it illustrates the significant mobility of the sparklet site over the course of 5.6 s (see also Video 2; further examples of mobile sparklets in Video 3). To our knowledge, simultaneous mobility in the plasma membrane and gating has not been previously reported for any ion channel, and are explored further below. Moving sparklet observed in whole cell patch clamped dorsal root ganglion cell after addition of capsaicin (100 nM). Fluo-4 is loaded into cell as an indicator for Ca2+ influx. Track of sparklet is super-imposed in red. Scale bar is 5 μm. Numerous mobile sparklets in whole cell patch clamped dorsal root ganglion cell after addition of capsaicin (100 nM). The heterogeneity of TRPV1 mobilities, with some sparklets immobile and others dynamic, indicates that the population of TRPV1 channels was heterogeneous in some aspect of channel structure or function. To determine the mechanisms involved in controlling TRPV1 mobility we measured the sparklet trajectories, as shown in Figure 1B, inset. Two factors, however, limited our ability to fully characterize these trajectories. The first factor, which is a general limitation of our approach in any cell type, was that our sparklet recording time was limited by the properties of the Ca2+-sensitive dye used. We required a dye sensitive enough to show the Ca2+ flux through just a single channel. The appearance of individual sparklets when capsaicin was added became difficult to discern over time as the fluorescence across the cell footprint increased. The increase in fluorescence ‘background’ was due to the rapid, global increase in intracellular Ca2+ that occurs over the course of our experiments. Although the Ca2+ chelator EGTA (10 mM) in our intracellular solution extended the useful recording time by acting as a Ca2+ sink, a rise in global Ca2+ due to continued influx of Ca2+ through TRPV1 ultimately obscured the sparklet signals once intracellular Ca2+ levels exceeded the upper limit of the Ca2+ sensitive dye's optimal range (Fluo-4: 1 μM Ca2+; Life Technologies, Carlsbad, CA). The second factor limiting our interpretation of sparklet activity in dorsal root ganglion neurons are the tube-like structures prevalent within the footprint of isolated neurons that brightened markedly when capsaicin was added. These tube-like structures were observed even when the SERCA inhibitor thapsigargin was present (Video 3), indicating that they are likely neurite-like processes underneath the cell footprint, rather than endoplasmic reticulum within the cell body. The processes hampered further characterization of capsaicin-activated sparklet activity in isolated dorsal root ganglion cells because in the confined space of the processes, global Ca2+ levels dominate sparklet signals very rapidly (Video 3). We attempted to circumvent this issue by conducting experiments very soon after cell isolation, before processes could form. However, cells studied soon after isolation, before significant processes had formed, showed footprints that were irregularly-adhered to the coverglass, and thus were not evenly within the evanescent TIRF field. Transient transfection of TRPV1 into the F11 cell line, a hybridoma formed between dorsal root ganglion cells and neuroblastoma cells (Stein et al., 2006), were examined as an alternative to primary cell culture. In experiments using the F11 line with the channel expressed as a fluorescent fusion protein, TRPV1-tagRFP, we did observe moving sparklets (Video 4). However, processes running under the footprint of F11 cells (Figure 1—figure supplement 3 and Video 5) interfered with sparklet characterization as they did in isolated dorsal root ganglion neurons. To study sparklet mobility we therefore turned to expressing tagRFP- and GFP-tagged TRPV1 (TRPV1-tagRFP and TRPV1-GFP) in transiently transfected HEK293T/17 cells, in which the neurite-like processes were not observed. Immobile and mobile sparklets in TRPV1-tagRFP transfected F11 cell after addition of capsaicin (100 nM). Arrow indicates the site where a moving sparklet appears in a process at 7.75 s. This video is an exception in that the frame rate is 20 Hz. Scale bar is 5 µm. Sparklets occurring in TRPV1-tagRFP transfected F11 cell after addition of capsaicin (100 nM). Pinpoint accuracy of sparklets is complicated by the uneven cell footprint within the TIRF evanescent field. Scale bar is 5 µm. See Figure 1—figure supplement 2. We examined whether HEK293T/17 cells would prove suitable for quantifying TRPV1 mobility and activity. TRPV1 channels expressed robustly in these cells, which proved a problem as single tagRFP-tagged channels could not easily be distinguished and therefore nor would individual sparklets. However, we found that performing our experiments within 12–18 hr of transfection yielded the sparse density of channels required. We found that, like isolated dorsal root ganglion neurons, TRPV1-tagRFP and TRPV1-GFP in HEK293T/17 cells showed mobile and immobile capsaicin-activated sparklets (Video 6). Sparklets were not observed in the absence of capsaicin nor in the absence of extracellular Ca2+ (Figure 2A). As shown in Figure 2B,C (see also Video 7), fluorescence from capsaicin-activated sparklets in HEK293T/17 cells had the signature two-amplitude intensities also observed in isolated dorsal root ganglion neurons (Figure 1—figure supplement 1). For these experiments we used Fluo-5F (200 μM) together with 10 mM EGTA in the pipette solution and 20 mM Ca2+ in the extracellular buffer to closely mimic the experiments of Navedo et al. (2005), who report on immobile sparklets from L-type Ca2+ channels (see ‘Materials and methods’). Interestingly, the amplitude of fluorescence intensity in the sparklets was comparable in isolated dorsal root ganglion neurons and HEK293T/17 cells (compare Figure 2D to Figure 1C). However, differences in the dye (Fluo-5F vs Fluo-4) and extracellular Ca2+ concentrations (20 mM vs 2 mM) make it difficult to draw any conclusions from this similarity. The open probability for sparklets in HEK293T/17 cells was significantly less than for sparklets in isolated dorsal root ganglion neurons (Figure 2E). This difference is consistent with the higher K1/2 for activation of TRPV1 expressed in HEK293T/17 cells (Collins and Gordon, 2013). Interestingly, capsaicin-independent increases in local Ca2+ were observed in untransfected as well as TRPV1-transfected HEK293T/17 cells. These could be easily distinguished from sparklets due to TRPV1 as their open times were very brief and their amplitude was spikey (Figure 2—figure supplement 1), rather than showing two states like TRPV1 (Figure 2B,C). These TRPV1-independent Ca2+ events were excluded from the analysis reported here. Immobile and mobile sparklets in TRPV1-GFP transfected HEK293T/17 cell after addition of capsaicin (100 nM). 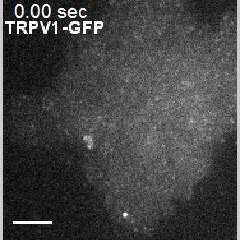 TRPV1-GFP fluorescence is observed in the first part of the video, and fluorescent sparklets become the dominant signal in second half of video with both mobile (bottom middle) and immobile sparklets present. Scale bar is 5 μm. Fluorescence intensity traces of immobile sparklet sites in cells loaded with Fluo-5F and extracellular buffer containing 20 mM Ca2+ and voltage-clamped as described in ‘Materials and methods’. (A) Without Ca2+ in the extracellular buffer very little green fluorescence was observed in the capsaicin-treated (100 nM) HEK293T/17 cell that was transiently transfected with TRPV1-tagRFP. The image in the top panel was acquired after a 30 s exposure to capsaicin. Addition of 20 mM Ca2+ to the extracellular buffer increased the fluorescence of the cell footprint dramatically and individual sparklet sites could be observed (indicated with white arrowheads in bottom panel). TIRF images have matching lookup table (LUT) values and have not been otherwise altered. Scale bar is 5 µm. (B) Representative trace of sparklet from TRPV1-tagRFP expressing HEK293T/17 cell. (C) All points histogram of trace in (B). (D) Mean fluorescence intensity (ΔF/F0) and (E) open probability (Popen) of dorsal root ganglion sparklets (Blue; same data as in Figure 1C,D) and TRPV1-tagRFP sparklets in HEK293T/17 cells (green; N = 4). Cut-off for ‘open’ is when intensity (ΔF/F0) exceeded 0.05. See Video 7. Immobile sparklet used to analyze TRPV1-tagRFP sparklet intensity levels (See Figure 2B). The two-state fluorescence intensity we observed with TIRF imaging of capsaicin-induced Ca2+ sparklets in dorsal root ganglion neurons and HEK293T/17 cells suggested that each sparklet was due to a single TRPV1 channel. To test this hypothesis, we used photobleaching to count the number of subunits per feature, using GFP instead of tagRFP due to its superior spectroscopic properties and because we did not need to avoid spectral overlap with the Ca2+-sensitive dye in these experiments. TRPV1 is a homomeric tetramer structurally similar to the voltage-gated superfamily of ion channels that includes voltage-gated K+ channels (Liao et al., 2013). Each TRPV1-GFP channel should thus have four copies of GFP per functional channel. If each fluorescent spot represents one TRPV1-GFP channel, four photobleaching steps should be observed. However, if each spot represents several TRPV1-GFP channels, >4 photobleaching steps should be observed. Because measuring the GFP fluorescence intensity of mobile TRPV1 channels proved difficult, paraformaldehyde-fixed cells were used in these photobleaching experiments. 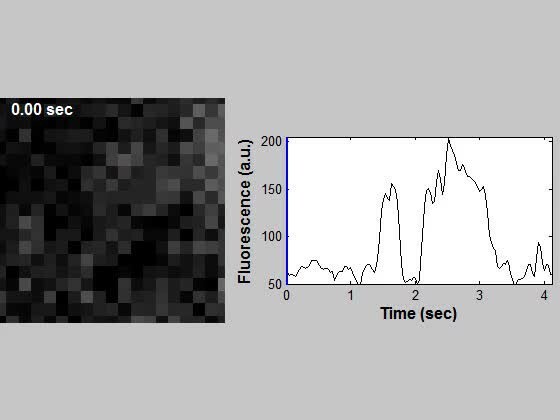 As shown in Figure 3A, using a high-intensity laser to image the fluorescence from individual TRPV1-GFP features produced sudden decreases in fluorescence intensity, each of which is presumed to represent photobleaching of a single GFP (Ulbrich and Isacoff, 2007). We observed from one to four photobleaching steps across the population of TRPV1-GFP and plotted a histogram of the steps (total number of sites with bleaching steps = 384), shown in Figure 3B. We then fitted the data with a binomial model given a fixed number of subunits, n, and the probability that each GFP monomer was able to fluoresce at the time the sample was first illuminated, p, as a free parameter (see ‘Material and methods’). The best fit was obtained using n = 4 and p = 0.45 (Figure 3B), and fits with n = 5, as would be the case if TRPV1 were pentameric, or n = 8, if TRPV1 tetrameric channels formed pairs, were both rejected by χ2 goodness-of-fit tests (Figure 3C and legend). Although p = 0.45 produced by the fit with n = 4 is low with respect to this value reported by others (Ulbrich and Isacoff, 2007; Ji et al., 2008; Zhang et al., 2009), our experiments were performed in fixed cells, a preparation known to partially disrupt fluorescent protein fluorescence (Chalfie and Kain, 1998). Together with the two-state fluorescence intensity of capsaicin-induced sparklets, these data indicate that each TRPV1-GFP feature represented one channel, with four subunits, rather than two or more channels, with eight or more subunits. Photobleachstep analysis of TRPV1-GFP in fixed HEK293T/17 cells. (A) Fluorescence time traces of six representative TRPV1-GFP features. Arrowheads indicate individual photobleach steps (B) Histogram of TRPV1-GFP bleach steps in fixed HEK293T/17 cells. TRPV1-GFP fluorescence is characterized as having 1–4 bleaching steps (blue). A zero-truncated binomial distribution fit by maximum likelihood estimate with n = 4 to give a probability of 0.45 (red) (χ2 goodness-of-fit is 0.1712 and the model is acceptable). (C) Fits to zero-truncated binomial distributions with n = 5 (cyan) or n = 8 (green) by maximum likelihood estimate gave probabilities of 0.35 and 0.21, respectively. Chi-squared goodness-of-fit tests were done with n = 5 and n = 8 models, yielding χ2 values of 4.0717 and 16.386, respectively. Unlike sparklet experiments, in which the duration of recording was limited by the properties of the Ca2+ chelators used, TRPV1-GFP experiments could proceed considerably longer. To further understand mechanisms underlying the spectrum of sparklet mobilities we observed, we performed a large survey of TRPV1-GFP mobilities by tracking diffusion of the channels in the plasma membrane. We acquired 15 s videos of TRPV1-GFP channels moving laterally in the plasma membrane of living cells and used the particle tracking algorithm u-track, which simplifies tracking of features in a large sample size and minimizes user bias in track identification (Jaqaman et al., 2008), to follow channel movements. 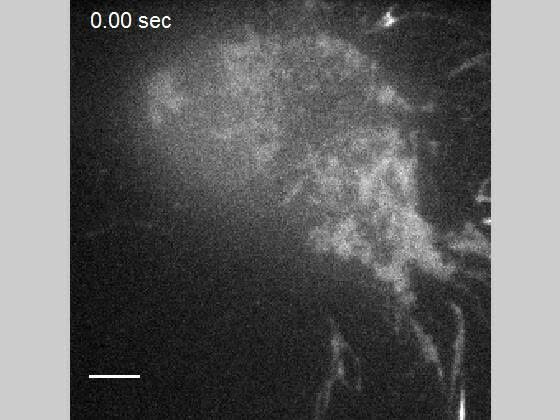 Channel trajectories for the first 6 s of a video are shown projected onto the last fluorescent image of the cell in Figure 4A (see Video 8). The mean squared displacements (MSD) of selected tracks labeled as 1, 2, and 3 are presented in Figure 4B. Each of the three tracks exhibited a different MSD vs time slope, which was characterized by an effective diffusion coefficient, Deff, as a measure of mobility. These data were then used to generate a histogram of effective diffusion coefficients for all the TRPV1-GFP channel tracks observed in the full 15 s video (Figure 4C). The large variability in channel mobilities, with a 20-fold range of Deff (0.01–0.5 μm2/s), is consistent with a heterogeneous population within any given cell. Interestingly, the distribution of mobilities between cells also varied, but only by about a factor of two (mean Deff range: 0.029 to 0.056 μm2/s) (Figure 4D and Figure 4—figure supplement 1). Distribution of TRPV1-GFP mobility in HEK293T/17 cell (not voltage-clamped; see ‘Materials and methods’). (A) TRPV1-GFP channel tracks in a 200 frame video (33 frames per second). Tracks are identified with the u-track algorithm (see ‘Materials and methods’) and are overlaid on the final image of the series (See Video 8). 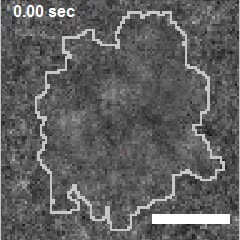 Extent of cell body is shown in grey. The inset is an isolated track from the bottom center of the larger panel labeled ‘3’. (B) Mean square displacements (MSD) at different time lags of three tracks identified as 1 (blue), 2 (green), and 3 (red) in (A). (C) A Histogram of effective diffusion coefficients derived from tracks in the full 15 s video for the cell shown in (A). Tracks identified as 1, 2, and 3 in (A) are indicated over their assigned bins. (D) Mean effective diffusion coefficients calculated from TRPV1-GFP tracks in HEK293T/17 cells (N = 5). Scale bar of image in (A) is 5 µm and inset scale bar is 1 µm. 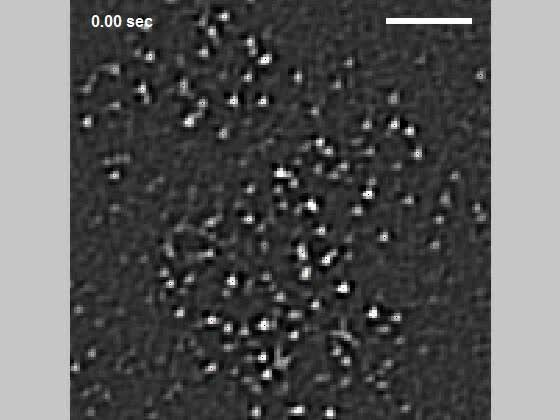 Video of TRPV1-GFP tracks in transfected HEK293T/17 cell (See Figure 4). To establish a one-to-one correspondence between capsaicin-induced sparklets and mobile TRPV1-GFP, we implemented an optical method to coincidentally detect sparklets while simultaneously tracking the channel movement with a GFP label. Figure 5A (red trace) shows the trajectory of a typical TRPV1-GFP channel that emitted sparklets along its track. In Figure 5B we plot the fluorescence intensity of the moving TRPV1-GFP channel as it increased intermittently to higher levels (see also Videos 9 and 10). TRPV1-GFP and sparklet observed in a moving channel in a voltage-clamped HEK293T/17 cell. (A) Track of TRPV1-GFP with increased sparklet intensity. Scale bar is 1 μm. (B) Fluorescence intensity trace of mobile TRPV1-GFP channel in (A) with sustained higher levels of fluorescence due to sparklet activity. The background image in (A) corresponds to the time annotated with an arrowhead in panel (B). (C) TRPV1-GFP and sparklet positions are shown as filled circles. Red circles are positions assigned to TRPV1-GFP and cyan circles are sparklet positions. Each circle's radius is 1/10 of the standard deviation attributed to the 2-D bivariate Gaussian fitted to the fluorescence feature at that position. Scale bar is 0.5 μm. See Videos 9 and 10. The TRPV1-GFP channel in the left video can be followed as a GFP feature as of 0.0 s with intermittent sparklet activity and at 6.33 s is a sparklet feature for the majority of the time. Scale is 6.25 pixels per 1 μm. Video with expanded view of Figure 5A and Video 9. This video shows the highly dynamic pool of TRPV1-GFP features before capsaicin (100 nM) opens the channels and the GFP signal is overwhelmed by sparklet activity and background Ca2+ levels. Box indicates the approximate location of the ROI used for Figure 5 and Video 9. Scale bar is 5 μm. To compare the confidence with which the sparklets and TRPV1-GFP fluorescence could be localized, we measured the uncertainty of the precision as an average of the standard deviations of a 2D bivariate Gaussian fitted to the fluorescence feature in each step of the trajectory shown in Figure 5A. We used circles representing the size of the uncertainty (1/10th scale) to indicate both which points were observed as sparklets (Figure 5C, cyan circles) and which as GFP (Figure 5C, red circles). The uncertainty for all the points (GFP and sparklet) ranged from 0.13 μm to 0.33 μm, allowing us to determine the positions of the fluorescent feature along the full track length. Two interpretations of these data stand out. First, the co-localization between TRPV1-GFP (Figure 5C, red circles) and the Ca2+ sparklets (Figure 5C, cyan circles) confirmed that mobile sparklets co-diffuse with mobile TRPV1-GFP channels. Second, the higher fluorescence intensity of sparklets compared to TRPV1-GFP did not impede our ability to localize sparklets as compared to TRPV1-GFP. The simplest interpretation of our data is that sparklets represent Ca2+ flux through the labeled TRPV1-GFP as it gates. The mobility of actively gating TRPV1 is somewhat surprising, as Ca2+ sparklets from TRPV4 were previously reported to be immobile (Mercado et al., 2014) as have sparklets attributed to L-type Ca2+ channels (Navedo et al., 2005; Navedo et al., 2006) and AchR channels (Demuro and Parker, 2005). In addition, in a search of the literature we did not find any reports of simultaneous observations of ion channel activity and mobility in living cells. However, the mobility of capsaicin-activated TRPV1 sparklets in three different cell types (isolated dorsal root ganglion neurons, F11 cells, and HEK293T/17 cells) raises the question of whether the mobility of other types of active channels should be reexamined. Does the heterogeneity of effective diffusion coefficients measured for the population of TRPV1-GFP reflect a functional heterogeneity of the channels? Upon examining a large number of mobile TRPV1-GFP channels under various conditions, we noticed that capsaicin appeared to decrease their mobility. We therefore hypothesized that channel mobility might be regulated as a function of channel activity. Because our experiments produced direct measurements of activity and mobility of single TRPV1 molecules, we could determine whether mobility changed upon channel activation. To test the hypothesis that TRPV1 activity may regulate its mobility, we examined whether the addition of capsaicin to HEK293T/17 cells transiently transfected with TRPV1-GFP produced a change in channel mobility. In control experiments with nominally Ca2+-free extracellular buffer and in which the cells were not subject to voltage clamp, we observed a trend of increasing MSD (Figure 6A). Although we did not study this effect further, we speculate it was due to photodamage by the excitation light. We did, however, design further experiments to take the observation-induced increase in apparent mobility into consideration. By expressing the data as a ratio of the change in MSD (RΔMSD, see ‘Materials and methods’ and Figure 6—figure supplement 1) before addition of capsaicin to that after the addition of capsaicin for TRPV1-GFP trajectories within the same cell, we were able to correct for the observation-induced effect on TRPV1-GFP mobility. Mobility change in TRPV1-GFP channels after capsaicin treatment in cells not subject to voltage clamp. (A) HEK293T/17 cells expressing low numbers of TRPV1-GFP are initially imaged for 15 s and then a second 15 s video follows perfusion with a 1 μM capsaicin solution (described in ‘Materials and methods’). All three treatment conditions begin in HBSS (containing Ca2+) with no capsaicin. Average MSD (time lag of 90 msec) for all tracks shows no significant change in mobility from before to after capsaicin. (B) Using the same source data, we characterize mobility with the MSD difference ratio (RΔMSD, described in ‘Materials and methods’ and Figure 6—figure supplement 1). With the switch from no capsaicin to 1 μM capsaicin but maintaining the Ca2+ concentration at 1.8 mM, the RΔMSD drops a significant amount from the initial condition (N = 5, blue data points) as determined by a one-tailed paired t-test (p < 0.01). This significant drop in RΔMSD from the initial video to the second video is not observed under conditions where the second solution contains no capsaicin and no added Ca2+ (N = 6 cells, green data points; n.s. : not significant) nor is it seen when the second solution contains capsaicin (1 μM) but no added Ca2+ (N = 6 cells, red data points). In cells treated with 1 μM capsaicin and remaining in a Ca2+-containing solution (but, as in control experiments, not voltage clamped), the RΔMSD of TRPV1-GFP in a given cell decreased upon the addition of capsaicin, indicating that the TRPV1 channels exhibited a decrease in mobility as they opened in the presence of Ca2+ (Figure 6B, blue). In control experiments that switched from a Ca2+-containing solution to a nominally Ca2+-free solution without capsaicin (Figure 6B, green) or to a nominally Ca2+-free solution with capsaicin (Figure 6B, red) no significant change between RΔMSD in our before and after videos was observed. This difference in RΔMSD between before and after capsaicin treatment while in the presence of Ca2+ persisted out to 120 msec (Figure 6—figure supplement 2). Thus, the decrease in RΔMSD required both channel activation (i.e., capsaicin) and Ca2+ influx. Our data indicate that the mobility of TRPV1-GFP decreased in a capsaicin- and Ca2+-dependent manner. Regulation of channel mobility by its activity was accessible because: 1) experiments were not truncated by saturation of a Ca2+-sensitive dye; 2) the recording of hundreds of channels per cell was possible when tracking mobility with GFP, whereas a much lower channel density was necessary for studying sparklets, 3) the HEK293T/17 cells were not voltage-clamped, allowing higher throughput imaging; and, most importantly, 4) unlike the Ca2+ dyes used to image sparklets, the fluorophore used for tracking the channels, GFP, could be imaged even when the channels were closed and even in the absence of extracellular Ca2+. The differences in experimental conditions between these experiments and those in which we measured the mobility of sparklets raised the question of whether an activity-dependent decrease in mobility would be observed for capsaicin-activated sparklets. Sparklets could be imaged only when channels were open and conditions were permissive of Ca2+ influx. Thus, the mobility of sparklets due to TRPV1 could not be measured before the addition of capsaicin to the bath. We therefore designed experiments to look at the trend in mobility for individual sparklets that took advantage of the relatively slow perfusion time of our chamber (estimated flow of five-times chamber volume in 30 s) using voltage-clamped HEK293T/17 cells as described in ‘Materials and methods’. The open probability of the channels would be expected to increase from near zero in the absence of capsaicin to ∼0.3–0.4 when the bath solution had equilibrated. 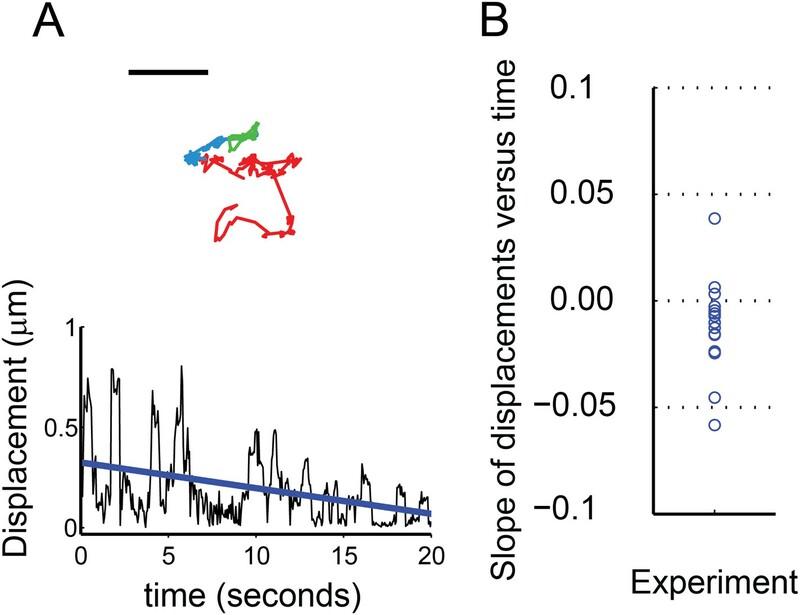 By measuring the time dependence of mobility under these conditions, we accumulated a set of trajectories on mobile and active TRPV1-GFP or TRPV1-tagRFP channels in which the concentration of capsaicin, and thus their open probability, increased over time. Our hypothesis predicts that the mobility of these sparklets will decrease over the course of the experiment. We found that 13 out of 16 sparklets analyzed during a period when they remained open and observable showed a capsaicin-dependent decrease in mobility (Figure 7). The decreased mobility of these sparklets is illustrated by the trajectory shown in Figure 7A (top). The red, blue, and green segments of the track represent the location of the sparklet during three consecutive epochs of equal duration. The first, red epoch was one of high mobility. The second and third epochs, represented in blue and green, respectively, showed markedly reduced mobility. Plotting the displacements as a function of time for this track (Figure 7A bottom), fitting it with a line, and calculating its slope was used to measure the trend in this track toward reduced mobility. One of the three sparklets that showed increased mobility upon activation is shown in Figure 7—figure supplement 1. The slopes of the lines from the 16 sparklets are shown in Figure 7B, revealing a trend towards decreasing mobility (negative slope; Figure 7B). In conclusion, activation of TRPV1 yielded a decrease in channel mobility, whether observed as the GFP-fusion protein or as sparklets. Characterization of mobile TRPV1 sparklets in voltage-clamped HEK293T/17 cells. (A) Trajectory of sparklet with decreasing mobility. The total steps of the trajectory are divided into three equal parts representing the first third (red), the second third (blue) and the last third (green) of each track. Scale bar is 1 μm. Displacement (see ‘Materials and methods’) plot of sparklet in (A) is shown below. The blue line is the slope used to characterize the change in displacements over time. (B) Slopes corresponding to the change in displacements of mobile sparklets (N = 16) in density plot with the center of the distribution located below 0.0. We recorded the activity of individual TRPV1 channels in live cells by imaging capsaicin-activated optical sparklets with TIRF microscopy. A fluorescent Ca2+ indicator (Fluo-4 or Fluo-5F) was introduced, along with the nonfluorescent Ca2+ chelater EGTA, into cells via a patch pipette, which also served to clamp the voltage at a potential empirically determined to minimize Ca2+ influx in the absence of capsaicin. Capsaicin and extracellular Ca2+ were required for sparklet formation in isolated dorsal root ganglion neurons and HEK293T/17 cells transiently transfected with TRPV1-tagRFP. TRPV1 sparklets are a new tool to address critical gaps in our knowledge concerning the function of TRPV1 in its native plasma membrane environment and opens the door to further exploration into how plasma membrane dynamics and cell signaling regulate TRPV1 function. Synchronous recording of localization and activity of native TRPV1 channels in isolated dorsal root ganglion neurons and of TRPV1-GFP or TRPV1-tagRFP channels in transiently-transfected HEK293T/17 cells revealed a surprising range of mobilities in the plasma membrane. Like the L-type Ca2+ channels (Navedo et al., 2005; Navedo et al., 2006), AchR channels (Demuro and Parker, 2005), and TRPV4 channels (Mercado et al., 2014) discussed above, some sparklets were immobile, whereas others diffused at a rate comparable to that expected for an individual lipid (∼1 µm2/s) (Golebiewska et al., 2008) (Figures 1, 2, 5 and 7). To our knowledge, gating of channels as they diffuse in the plasma membrane has not been previously reported, although synchronous gating and diffusion may well represent the ‘natural’ behavior of many channels and transporters. We combined our studies of capsaicin-induced sparklets in isolated dorsal root ganglion neurons and transiently-transfected HEK293T/17 cells with imaging studies of TRPV1-GFP in HEK293T/17 cells to determine the number of TRPV1 channels underlying the sparklets. Sparklets have been used previously by Navedo et al. to report on the gating of L-type Ca2+ channels as single channels or in clusters of up to seven channels (Navedo et al., 2005), or assemblies of TRPV4 channels in arterial myocytes (Mercado et al., 2014). The immobile TRPV1-tagRFP sparklets allowed us to measure the fluorescence intensity of capsaicin-induced sparklets and determine the number of channels at each sparklet site. The two-state fluorescence signature of the TRPV1-tagRFP sparklets could arise from single-channel openings or from multiple channels at each sparklet site with very high gating cooperativity (Figure 2). Analysis of the photobleaching steps attributed to TRPV1-GFP channels in fixed HEK293T/17 cells provided further confirmation that the channel assembles as a tetramer of TRPV1-GFP subunits without forming higher order oligomeric assemblies (Figure 3). Importantly, laterally mobile TRPV1-GFP in live cells could be tracked via both their fluorescent protein label and their sparklet activity, and switching from a lower fluorescence emission of the fluorescent protein label to the higher intensity sparklet fluorescence within the same feature demonstrated that the mobile sparklets emanated from mobile TRPV1-GFP (Figure 5 and Video 9 and Video 10). Together, these data indicate that each capsaicin-induced sparklet is due to the activation of one, and only one, TRPV1 ion channel. This doesn't preclude higher number assemblies from forming, but these were never observed in our transiently transfected cells. Our data on dorsal root ganglion sparklets activated by capsaicin recapitulates our observations in TRPV1-GFP and TRPV1-tagRFP expressing HEK293T/17 cells (Figure 1A and Figure 1—figure supplement 1). Our investigation into the lateral mobility of TRPV1 as it is influenced by the channel's activity has barely begun to scratch the surface of what may be an important new mode of functional regulation. However, our finding that Ca2+ influx is required for the capsaicin-induced decrease in TRPV1 mobility may hint at the mechanism by which the change in mobility occurs. Changes in the cytoskeleton upon upregulation of Ca2+-sensitive effectors such as α-actinin, gelsolin or scinderin (Rodriguez Del Castillo et al., 1990; Witke et al., 1993; Kinosian et al., 1998) can be easily imagined to regulate membrane protein mobility. The formation of local Ca2+ domains has previously been linked to regulation of cell architecture and remodeling of the cytoskeleton. A recent study looking at the influence of TRPM7 elicited Ca2+ micro-domains in migrating fibroblasts identified this process as part of the mechanism by which the cell steers towards a chemoattractant (Wei et al., 2009, 2012). Thus, the involvement of cytoskeleton in the Ca2+-influx mediated regulation of TRPV1 mobility is a subject of interest for future studies. We and others have shown that TRPV1 binds to several proteins important to cell signaling, including the p85β subunit of PI3-kinase and the TrkA receptor (Chuang et al., 2001; Stein et al., 2006). These interactions are likely related to a physiological response facilitated by nerve growth factor (NGF) that increases cell surface expression of TRPV1 (Zhang et al., 2005; Stein et al., 2006). Biochemical and electrophysiological experiments also point to a complex formed between AKAP79/150 and TRPV1 to alter sensitization of TRPV1 in response to inflammatory agents (Zhang et al., 2008; Por et al., 2010; Efendiev et al., 2013). Differential properties of a signaling complex involving TRPV1 could be determined by the mobility of the channel, which makes its activity dependent mobility a point of interest. One can imagine that the activity of TRPV1 will confine the channel to a specific region of the cell, where it may (or may not) be more likely to encounter its binding partners in the PI3-kinase/ TrkA receptor complex. It is further possible that the binding of TRPV1 to a complex with a consequent change to the channel's mobility also feeds back on its function. At this point, we can only speculate on the physiological role of activity-regulated changes in TRPV1 mobility. Perhaps decreased mobility in regions of locally elevated channel activity serves as a sort of diffusion trap, concentrating TRPV1 channels in parts of the cell where they are most needed. Sensory neurons with cell bodies in the dorsal root ganglia are not very polarized (Dubin and Patapoutian, 2010). Indeed, in culture without other types of neurons they do not form synapses; in their role as sensory receptors they are not postsynaptic to other cells types and appear to have lost the signaling required to form postsynaptic structures. Other mechanisms for protein targeting might thus be prominent in these types of cells. Molecular Cloning—The C-terminal GFP-labeled and tagRFP-labeled TRPV1 were made by subcloning the relevant fragments into the pCDNA3 vector, as previously described for our TRPV1-CFP (cyan fluorescent protein) construct (Ufret-Vincenty et al., 2011). Cell Culture and Electrophysiology—Mouse dorsal root ganglia cells were isolated as previously described (Stein et al., 2006). Nerve growth factor was added to the final medium at a concentration of 100 ng/ml and experiments were completed within 24 hr of sacrifice of the mouse. Whole-cell voltage clamp recordings of capsaicin dose responses in Figure 1—figure supplement 2 were done as previously described (Stein et al., 2006). F11 cells were cultured as described previously (Stein et al., 2006). HEK293T/17 cells (ATCC, Manassas, VA) were cultured in Dulbecco's Modified Eagle Medium (DMEM; Life Technologies) supplemented with 10% fetal bovine serum, 50 units/ml penicillin, and 50 µg/ml streptomycin at 37°C and 5% CO2. For both cell lines, low expression levels of the TRPV1-GFP or TRPV1-tagRFP protein was obtained with transient transfection by Lipofectamine 2000 (Life Technologies) at suboptimal concentrations of plasmid DNA (250 ng DNA to 1 μl Lipofectamine in one 35 mm well) and decreased incubation times (2 hr) as compared to the manufacturer's instructions. Cells were passaged after 12 hr onto poly-L-lysine coated glass coverslips in Hank's Buffered Saline Solution (HBSS: 140 mM NaCl, 4 mM KCl, 1 mM MgCl2, 1.8 mM CaCl2, 10 mM Hepes, 5 mM glucose at pH 7.4) and experiments were conducted 2 hr later. Imaging of TRPV1-GFP in Figure 4, Figure 6, Figure 6—figure supplement 2, and Video 8 was performed in HBSS or nominally Ca2+-free solution (identical to HBSS except MgCl2 = 2.0 mM and no added Ca2+) as indicated. Activation of TRPV1-GFP in Figure 6 experiments was accomplished with 1 μM capsaicin (from DMSO stock) in HBSS or nominally Ca2+-free solution. Ca2+ influx through TRPV1-GFP, TRPV1-tagRFP or native TRPV1 channels was recorded as a current in whole-cell configuration of patch clamp with the membrane potential held at −40 mV, while simultaneously observing sparklets as previously described (Navedo et al., 2005). During sparklet experiments in dorsal root ganglion cells (Figure 1 and Figure 1—figure supplement 1 and Videos 1–3) and moving sparklet experiments in HEK293T/17 cells (Figure 5, Figure 7 and Figure 7—figure supplement 1, Videos 9 and 10), we perfused the following bath solution (in mM): 140 N-methyl-D-glucamine (NMDG), 5 CsCl, 1 MgCl2, 10 glucose, 10 HEPES, and 2 CaCl2 adjusted to pH 7.4, which is close to a physiological concentration of Ca2+. In experiments quantifying the immobile sparklet intensities of TRPV1-tagRFP in HEK293T/17 cultured cells (Figure 2 and Figure 2—figure supplement 1, Video 7), the bath solution was changed to 20 mM CaCl2 and 120 mM NMDG to increase fluorescence signal (see reason given below for Fluo-5F use). In Figure 2A a nominally Ca2+-free NMDG solution was used as previously described with 120 mM NMDG but with no added Ca2+. Pipettes were filled with a solution composed of (in mM) 110 Cs-aspartate, 20 CsCl, 1 MgCl2, 5 MgATP, 10 HEPES, 10 EGTA, and either 0.2 Fluo-5F (immobile sparklets in HEK293T/17 cells; Figure 2, Figure 2—figure supplement 1, Video 7) or Fluo-4 (dorsal root ganglion sparklets: Figure 1 and Figure 1—figure supplement 1 and Videos 1–3; moving sparklets in HEK293T/17 cells: Figures 5 and 7, Figure 7—figure supplement 1, Videos 9 and 10) adjusted to pH 7.2 with CsOH. Both Fluo-4 and Fluo-5F were purchased from Life Technologies. Although Fluo-4 was used in dorsal root ganglion cell experiments and moving sparklet experiments in HEK293T/17 cells because of its increased affinity for Ca2+ and improved fluorescence signal in physiological solutions (2 mM Ca2+), we used Fluo-5F dye for the immobile sparklet experiments in HEK293T/17 because we wished to more closely follow the methods of Navedo et al. (2005), who previously studied Ca2+ sparklets from voltage-gated L-type Ca2+ channels in HEK293T/17 cells, and the cells were also allowed to equilibrate with the pipette contents for 2 min before each experiment. For F-11 cell sparklet experiments (Figure 1—figure supplement 3 and Videos 4 and 5), we used standard HBSS buffer and 0.2 mM Fluo-4 pipette solution, as described above. TRPV1 activation was induced by perfusion with either of the previously mentioned NMDG bath solutions supplemented with 100 nM capsaicin (from DMSO stock). For some experiments, Ca2+ was depleted from intracellular stores by pre-incubating the cells for 5 min before experiments commenced in the NMDG buffer supplemented with 1 µM thapsigargin. Total internal reflection fluorescence (TIRF) microscopy—Fluorescence images of cellular structure in close proximity to the coverslip (∼100 nm) were obtained through a Nikon Ti TIRF illumination microscope with a 100× 1.45 NA oil objective and a QuanEM:512SC Photometrics electron multiplying CCD camera. The 488 nm line of a 100 mW argon laser (Melles Griot, Albuquerque, NM) was used for all fluorophores except tagRFP, for which a 40 mW 561 nm solid state laser (Coherent, Santa Clara, CA) was used. 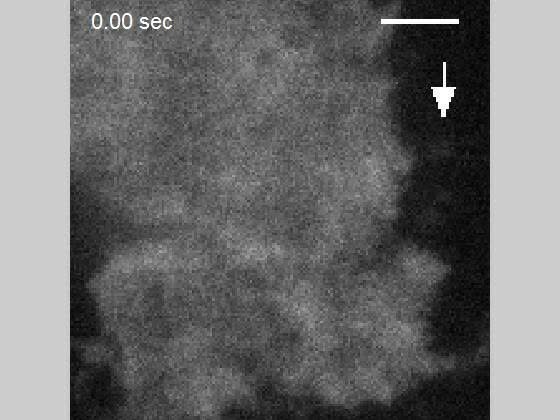 Imaging of TRPV1-GFP for channel tracking (Figures 4 and 6, Figure 6—figure supplement 2, Video 8) was done at 33 Hz at 100% laser power. Mobile sparklets were captured at 33 Hz at 100% laser power while immobile sparklet intensity experiments (except experiments in Figure 1A and Figure 1—figure supplement 1) were recorded at 50 Hz at 20% laser power. All sparklet imaging began with capsaicin perfusion. Raw images acquired with NIS Elements (Nikon Instruments Inc., Melville, NY) were imported into ImageJ (http://rsbweb.nih.gov/ij/) for post-acquisition processing. Image Processing and Analysis—Data collected on moving TRPV1-GFP (Figure 4) was processed in ImageJ by 1) removing background with a three pixel radius rolling ball filter, 2) averaging five frames together with the Windowed-sinc Filter plugin (http://rsb.info.nih.gov/ij/plugins/windowed-sinc-filter.html) using a spatial frequency cut-off of 0.2, and 3) filtering the fluorescent feature with the spot enhance plug-in at 1.25 pixels (Daniel Sage, spot tracker 2D,Sage et al., 2005). Detection and tracking of the channels was accomplished with the u-track software (http://lccb.hms.harvard.edu/software.html) in Matlab (www.Mathworks.com, Natick, MA) (Jaqaman et al., 2008). Within the u-track program, the following features were selected: We chose to supply a background sample for detection purposes, the maximum gap between two segments of a track could be eight frames, the option to search for directed movement was deselected, and a maximum of three pixels movement between frames was imposed as a rule for finding tracks. Mean squared displacements [(MSD), 〈(R→(t+τ)−R→(t))2〉] in Figure 4 were calculated from time averages of the x and y coordinates determined in the aforementioned u-track program. To estimate an effective diffusion, MSD values for lag times of up to 10 frames (1 frame = 30 msec) were fitted with the equation for a particle diffusing in two dimensions [[〈ΔR→2(t)〉=4Dt]] (Berg, 1993). In preparation for analyzing sparklet intensity and movement observed in endogenous TRPV1, TRPV1-tagRFP and TRPV1-GFP expressing cells, we first normalized TRPV1 sparklet signal to an average from images acquired before sparklets were observed, as previously described (Demuro and Parker, 2005). In the case of immobile sparklet intensity analysis (Figures 1A and 2 and Figure 1—figure supplement 1, and Figure 2—figure supplement 1), all points histograms of the normalized intensity were generated in Igor Pro (Wavemetrics, Lake Oswego, OR), with baseline subtraction to account for rising global Ca2+ signal in background and (ΔF/F0) collected in a 12 × 12 (6 × 6 for dorsal root ganglion neuron experiments) pixel region-of-interest (ROI) centered on each sparklet. In the case of sparklet movement analysis (Figures 1B, 5, 7) five frames were averaged in time with the frequency cut-off set to 0.1 using the Windowed-sinc filter plug-in (ImageJ). Tracking of individual sparklets was then semi-autonomously performed with the ImageJ Spot Tracker 2D plug-in (http://bigwww.epfl.ch/sage/soft/spottracker/). In Figure 5, the TRPV1-GFP fluorescent feature was tracked at an early stage of sparklet activity so that longer segments of the track represented contiguous positions of the GFP fluorescence followed by segments of sparklet fluorescence. Spot Tracker 2D does not provide the uncertainty for each position in the track, and we wished to compare the precision in measuring sparklet to GFP single molecule positions. We used Matlab (www.Mathworks.com) to calculate the standard deviations (x- and y-direction) of a 2D bivariate Gaussian function fit to an ROI centered on each fluoroescent peak recovered by ImageJ Spot Tracker 2D (Schmidt et al., 1996; Cheezum et al., 2001). A bivariate Gaussian was used because time averaging of the frames could stretch the feature by a small degree, and the uncertainty for the precision was calculated as the average of the two standard deviations. The region we ascribed to the feature (5 × 5 pixels) was chosen as a compromise between isolating the feature of interest from surrounding unrelated signals and recovering the full shape of the GFP or sparklet feature. As TRPV1 channels opened, the background fluorescence levels gradually increased during the course of the video. Although most single particle detection methods rely on a background offset in their fitting function to accommodate a slowly varying and evenly distributed background level, we found that the highly variable and changing background levels of sparklet videos necessitated a background subtraction and additional fitting constraints in the tails of the 2D Gaussian fit. To suppress any effect that the background fluorescence had on our fits, an additional two layers of pixels surrounding the 5 × 5 pixel region were used to calculate a mean background level. This mean background was subtracted from the pixels in our 5 × 5 feature region, and the two layers of pixels were padded onto our feature region as zero-valued to extend the total fitted ROI to a 9 × 9 region. In Figure 7, tracks were selected based on their contiguous sparklet fluorescence signals for ease of tracking. Fluorescence from GFP was not observed in the course of these videos due to the high background fluorescence (for example, see Video 6). This allowed us to pool displacement data from TRPV1-GFP and TRPV1-tagRFP in our analysis. Displacements of sparklet positions in Figure 7 and Figure 7—figure supplement 1 were determined for time points that are 10 steps apart (i.e., frame i to i + 10) to: 1) minimize the random noise contribution and 2) have greater confidence in the precision of the displacement calculation. Quantification used to assess the effects of capsaicin on TRPV1-GFP mobility in Figure 6 and Figure 6—figure supplement 2 was based on the trajectories acquired through the u-track program as described above with the following additional steps: 1) A mask to exclude regions of high channel densities is used when deemed necessary and consistently applied to all videos made on the same cell. 2) The MSD was calculated for time points 90 msec (3 frames) apart in Figure 6 and 120 msec (4 frames) apart in Figure 6—figure supplement 2. 3) An MSD difference metric to compare the mobility of channels in the same cell before and after capsaicin treatment was implemented to emphasize trajectory differences due to TRPV1-GFP movements and to minimize changes over time caused by photobleaching. The number of tracks contributing to each average MSD in a video ranged from ∼80-600. The MSD difference ratio (RΔMSD) reduced the impact of photobleaching on a particular cell by normalizing to the MSD measured in the first part of each video (see Figure 6—figure supplement 1). Single Molecule Photobleaching—HEK293T/17 cells, transiently transfected for low expression levels of TRPV1-GFP, were transferred to uncoated coverslips and allowed to recover in HBSS for 2 hr before being fixed with a 12 min incubation in a 4% paraformaldehyde solution prepared in HBSS. HBSS buffer was also used for the rinses and for imaging. 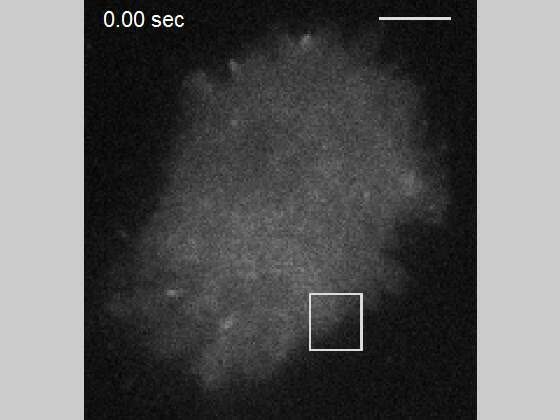 Imaging with TIRF microscopy on the previously described Nikon instrument was performed at 100% 488 nm laser power, 10 Hz acquisition speed, and with 2 × 2 binning of the pixels using the QuantEM camera. Post-acquisition processing of the images entailed subtracting off a 7 × 7 pixel smoothed image from each frame and identifying potential bleach steps in the temporal fluorescence intensity traces of 3 × 3 ROIs centered on individual channel sites as previously described (Demuro et al., 2011). A zero-truncated binomial distribution (R-forge, 2008–2009), (nk)pk(1−p)n−k1−(1−p)n, was fitted to the data of photobleaching steps by maximum likelihood estimates using Matlab (www.Mathworks.com) to determine the probability of functional GFP in fluorescent features containing up to four, five, or eight GFP molecules. The best fit probability for GFP fluorescence, p, and number of GFP sites per fluorescent feature, n, was selected using a χ2 goodness-of-fit test. For ease of interpretation the fluorescence intensity traces in Figure 3A were also filtered with a three-point running average. The Journal of Physiology 579:187–201. Proceedings of the National Academy of Sciences of USA 109:18174–18179. Green fluorescent protein : properties, applications and protocols, Chichester, Wiley-Liss, New York, p. xiii, 302, , 385. The Journal of General Physiology 126:179–192. Proceedings of the National Academy of Sciences of USA 108:17832–17837. The Journal of Clinical Investigation 120:3760–3772. The Journal of Biological Chemistry 288:3929–3937. Molecular Biology of the Cell 19:1663–1669. American Journal of Physiology Cell Physiology 305:C568–C577. The Journal of Neuroscience 22:7444–7452. Proceedings of the National Academy of Sciences of USA 105:13668–13673. The Journal of Biological Chemistry 283:26208–26216. The Journal of Neuroscience 17:3525–3537. Proceedings of the National Academy of Sciences of USA 105:2011–2016. The Journal of Physiology 560:627–638. The Journal of Neuroscience 27:7070–7080. The Journal of General Physiology 143:559–575. The Journal of General Physiology 127:611–622. Proceedings of the National Academy of Sciences of USA 102:11112–11117. American Journal of Physiology Cell Physiology 298:C211–C220. The Journal of Pharmacology and Experimental Therapeutics 306:387–393. A guide on probability distributions, pp R-forge distributions Core Team: http://dutangc.free.fr/pub/prob/probdistr-main.pdf. IEEE Transactions on Image Processing 14:1372–1383. Proceedings of the National Academy of Sciences of USA 93:2926–2929. The Journal of General Physiology 128:509–522. The Journal of Physiology 591:6175–6191. The Journal of Biological Chemistry 286:9688–9698. Current Opinion in Cell Biology 24:254–261. The Journal of Cell Biology 121:599–606. Proceedings of the National Academy of Sciences of USA 103:9357–9362. Proceedings of the National Academy of Sciences of USA 106:15679–15683. Proceedings of the National Academy of Sciences of USA 106:18028–18033. Thank you for choosing to send your work entitled “Activity and Ca2+ regulate the mobility of TRPV1 channels in the plasma membrane of sensory neurons” for consideration at eLife. Your full submission has been evaluated by John Kuriyan (Senior editor), Rick Aldrich (Reviewing editor), and two other peer reviewers. The decision was reached after discussions between the reviewers. We regret to inform you that your work will not be considered further for publication. All the reviewers recognize the work as an impressive and interesting technical achievement. However they feel that a substantial amount of additional work would be necessary to fully address the technical issues delineated in the individual reviews, which are appended below. eLife seeks to avoid requiring authors to preform extensive additional experimental work as a requirement for acceptance. The work is a technical achievement in simultaneously tracking movement of TRPV1 channels in the membrane and channel activity, measured by calcium sparklets. 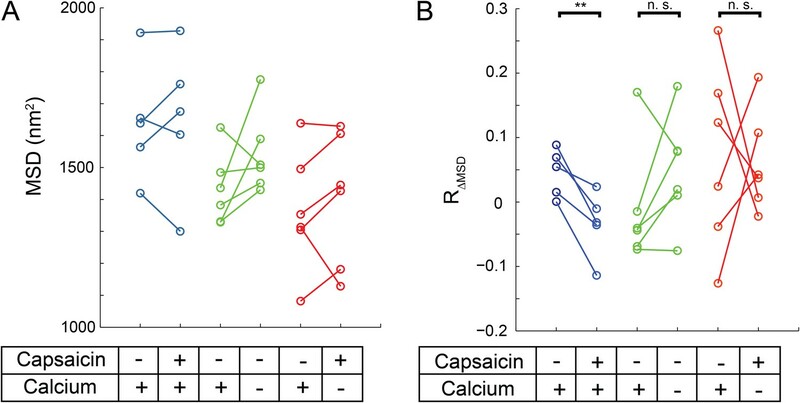 The central interesting finding is that channel mobility decreases after activation by capsaicin. The data are nice and the story is well presented. There is a serious deficit is in the statistical treatment of the photo bleaching data. A “best fit” is presented with no description of how it was determined to be best or how much better it was than fits with other parameters. 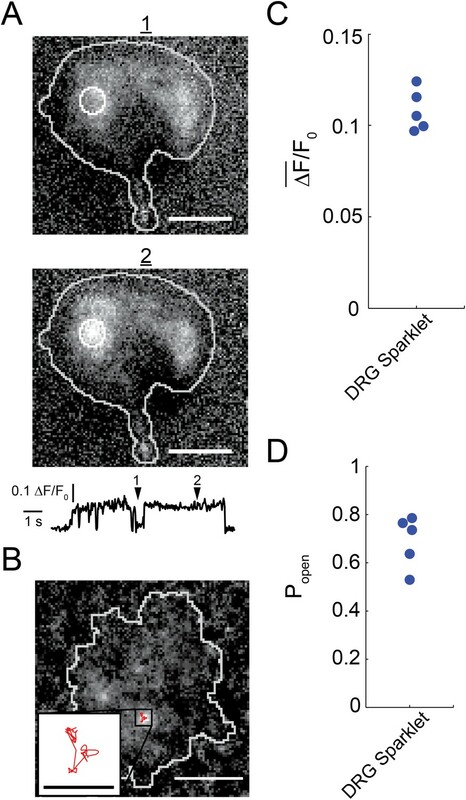 In this paper by Senning and Gordon, the diffusional behavior of the ion channel TRPV1 at the plasma membrane is studied with TIRF microscopy in DRG neurons, F11 and HEK cells. The authors succeed in imaging the real–time activity of the channel by imaging calcium “sparklets” that occur as the moving channel gates. The authors should be commended in pioneering and accomplishing this difficult experiment. In general, I think this paper is interesting and opens up new and exciting directions for ion channel research. The main question of the paper is summarized in the authors’ own words: “whether actively gating channels can be mobile and whether their mobility is linked to their activity.” This has been an unanswered question. How mobility changes in a channel might affect signaling, however, is still unknown. The data in the paper is well presented and the findings are clear. The paper is well written. I have several comments that the authors should address. 1) As far as I can tell from the data the majority of the imaging was done in patch-clamped cells in the presence of cytosolic calcium chelator and thapsigargin. Did the authors observe the same diffusional behavior and change in diffusion with the addition of calcium and ligand in intact (non–patched) cells expressing TRPV1–GFP (or RED)? I am concerned that the chemical manipulations that aided in imaging sparklets could change the “wild–type” diffusional behavior of the channel? You could imagine that if the cytoskeleton is altered by calcium (which it is) and the channel's movements are dependent on the cytoskeleton then these manipulations which buffer calcium could have non–physiological consequences on the channel's behavior. Showing data of TRPV1–GFP in intact cells (with and without ligand) would be a helpful control for this concern. 2) Does every channel gate (have a sparklet) or is there only a subset of channels that do? Do all channels slow down or just a subset? For example, do only channels with sparklets slow or do all channels slow regardless of their activity? It is difficult to see this from the way the data is presented. Specifically, the data is plotted as means from individual cells but in this format I cannot tell if all the channels slow or just a few have massive changes in diffusion. A supplement with histograms of diffusions for all tracked channels or box–and–whisker plots of the full data set would be nice. Is the behavior homogeneous across the cell or are there regional differences in diffusion across the foot–print? 3) Is this a general phenomenon for all membrane proteins (or ion channels) or is this specific for TRPV1? Do other ion channels show this behavior in these cells under these conditions? Is this effect due to a global change in the cell, membrane, or cytoskeleton? 4) How does the duration of the sparklet (visible open time) compare to single channel recordings of TRPV1? The open times seem very long (∼10 sec). Is this seen in electrophysiology data? The authors should discuss in more detail how their data compares to past recordings of TRPV1 under similar conditions? 5) How does the diffusion coefficient of TRPV1 compare to other membrane proteins or lipids? Could the authors please discuss this in more detail the paper? The authors provide the first measurements of elementary calcium fluxes through TRPV1 channels, and perform measurements of TRPV1 motility with single particle tracking. These are very demanding experiments, and individually intrinsically difficult to analyze. Together, it presents an exceptionally difficult challenge. The authors present evidence that TRPV1 channel activity may affect channel motility. The current work lacks a coherent rationale, experimental structure, mechanistic basis, and physiological relevance. The study seems to be an assortment of different control experiments with some superficial analysis. Experiments were performed similar to how Santana and colleagues performed their L–type Ca2+ channel sparklets. With fluo–4 and EGTA (10 mM) delivered through a patch pipette, and cells held at a negative holding potential. The only difference is that they held at –40 mV (compared to –70 mV for L–type sparklets). They argued that this was so “to minimize the activity of voltage–gated Ca2+ channels while also limiting the driving force of Ca2+ into the cell, which would reduce the duration of our experiments as the global rise in Ca2+ obscures the signal due to single TRPV1”. So it isn't clear why –40 mV was chosen, L–type calcium channel activity would likely be greater at –40 mV than –70 mV. Also –40 mV does not minimize the driving force when the calcium equilibrium potential is +120 mV. In addition, the 10 mM EGTA should be capable of buffering global changes in cytosolic Ca2+. Furthermore, these recordings represent the first measurements of TRPV1 sparklets, and therefore a number of criteria should be fulfilled, e.g., quantal levels should depend on the calcium electrochemical gradient and not on the nature of the agonist or antagonist. TRPV1 agonists and antagonists should affect the probability of a sparklet but not the quantal level. The power of single particle tracking analysis relies on the algorithms used to define and measure the displacement of a fluorescent pixel pattern (which needs to better explained in the manuscript). Typically, the location of an individual particle is defined by the fitting a 2D Gaussian function with a set standard deviation that encompasses the pixel pattern. These algorithms work well with single fluorescent particles due to the high signal–to–noise ratio between the particle and the surrounding environment (i.e., small standard deviation of the 2D Gaussian fit that equal the relative size of the particle). Like any statistical analysis, the smaller the variability, the higher the confidence in the calculated mean value, or in this case the 2D location of the particle. Attempts to apply these methods of analysis to larger more variable and dynamic “particle” like Ca2+ release events would be extremely difficult. The relative size, or spatial spread of Ca2+, would increase the standard deviation of the 2D Gaussian fit, and therefore decrease the confidence of the location of the particle. To strengthen these data, the authors would need to perform several control experiments to show that this is not true. With the ability to simultaneous record Ca2+ events and GFP tagged channel, do the MSD's for the Ca2+ event match up with the trajectory of individual tagged channels? How do the authors resolve the movement of a single particle of GFP during a Ca2+ event when the fluorescence signal of a given area is saturated with the underlying fluo–4 signal? I would predict the standard deviation of 2D Gaussian fit would increase, therefore decreasing the confidence of the 2D mean placement. This may lead to the interpretation that the mobility of the channel to be slower (or no not moving at all). What is the density of TRPV1 sparklet sites for a given cell? 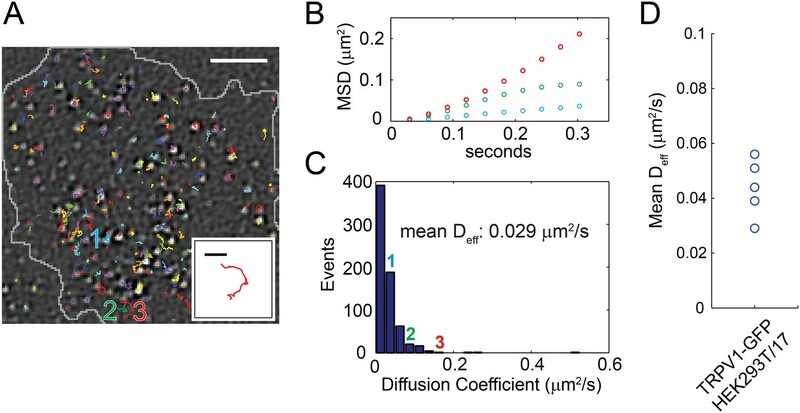 It is apparent from Figure 2, that the number of channels on the plasma membrane is high (Methods: ∼80–600 channels), yet not all of those channels may be actively conducting Ca2+ to elicit a sparklet (it would be hard spatially resolve 80–600 individual sparklet sites). Therefore, the analysis performed of Figure 7A may not accurately characterize the Ca2+ dependency of channel mobility as it cannot separate the active from the inactive channels. In the Results section, the authors conclude that TRPV1 channels exhibited a decrease in mobility following that activation of Ca2+ sparklets by capsaicin. With the current data, it would be difficult to conclude whether the slower mobility occurs before or after the influx of Ca2+. This is the old chicken versus the egg conundrum. One possible way to address this would be to plot the Ca2+ event (F/F0) and time–averaged MSDs on the same time scale, and see whether the Ca2+ event coincides with a change in the MSD for a given site. As indicated in the Discussion, there is evidence that TRPV1 and AKAP79/150 form a complex which presumably would affect motility as well as the activation of associated calcineurin. Does either of the cell types used here (DRG or HEK cells) express AKAP150, and is it related to motility? The reviewers expressed considerable enthusiasm for the work, but noted that extensive changes would be required. We have taken the critiques very seriously, and we have performed both new experiments and considerable new analysis that we believe would fully satisfy the reviewers. Our observations of gating events in diffusing ion channels is unprecedented. Our finding that mobility is coupled to channel activity and Ca2+ influx open a whole new field of study. We have included new analysis of the data, fitting them with alternative models and showing the results of these fits in new Figure 3C. The statistical analysis we used to discriminate among the models and the confidence with which we can discriminate are now fully described. Specifically, with n=4 the estimate for p=.45 is correct with a 95% confidence interval of 0.42-0.48. Chi^2 test of the observed versus expected pdf values was 0.1712 and should not be rejected. An identical fitting treatment with n=5 and n=8 yielded Chi^2 values of 4.0717 and 16.386, respectively, and were rejected for the tabulated values with appropriate degrees of freedom. The reviewer’s comments brought to our attention a serious problem with the clarity of our presentation. We had exactly the concerns raised by the reviewer, and we included the appropriate controls in the original submission of the manuscript. We have significantly improved the presentation by reorganizing the order of the presentation, more clearly stating experimental conditions in the text, and adding needed information to the figure legends. The requested studies of TRPV1–GFP mobility in non-patch clamped cells allowed to regulate their Ca2+ levels without interference of experimentally added Ca2+ buffers are shown in Figure 4 and Figure 6 and discussed in their own section of the text. In addition, we have new analysis that demonstrates parallel behavior by TRPV1–GFP in non-patched cells and TRPV1–GFP with sparklets in cells dialyzed with EGTA and a Ca2+ dye and studied under voltage-clamped conditions (Figure 5C). The relationship between activity and mobility for single TRPV1 molecules is not a question that would have been raised prior to this study. We agree with the reviewer that, in light of our new work, this relationship begs to be addressed. We are currently developing the technology that will be required to address the reviewer’s questions, but we believe that the set of required experiments represents a full R01 proposal, well beyond the scope of the current study. Independent color channels will have to be used for sparklets and TRPV1, so that mobility and activity can be independently measured. Nonetheless, we provide new analysis in new Figure 5C to move as close to this question as possible using existing methods. We have also included new experiments to allow the behavior of individual sparklets to be compared across different types of cells, and show these data in new Figure 2D and new Figure 2E. We share the reviewer’s excitement to learn whether the new phenomenon we present here represents a general cellular strategy for controlling activity and mobility. Although a survey of many membrane proteins using our approach would be useful, the literature already provides us with a partial answer. Sparklets have been reported for L–type Ca2+ channels, AchR channels, and TRPV4 channels. In all reported cases, the sparklets were not mobile. Yet TRPV1 is mobile in at least three cell types: isolated dorsal root ganglion neurons, HEK293T/17 cells, and F11 cells. We believe mobile gating channels are likely to be the rule, rather than the exception, but it will take many studies by a number of groups to establish whether this is the case. We have performed the requested analysis and include the results in new Figure 1D, Figure 1–figure supplement 2, and Figure 2E. We have used these figures as the basis for new discussion in the main text. We now show that the variance of TRPV1 mobility within a given cell is at least an order of magnitude greater than that seen between cells. We have improved the Discussion to put the effective diffusion constants measured for TRPV1 in a broader context. Experiments were performed similar to how Santana and colleagues performed their L–type Ca2+ channel sparklets. With fluo–4 and EGTA (10 mM) delivered through a patch pipette, and cells held at a negative holding potential. The only difference is that they held at –40 mV (compared to –70 mV for L–type sparklets). They argued that this was so “to minimize the activity of voltage–gated Ca2+ channels while also limiting the driving force of Ca2+ into the cell, which would reduce the duration of our experiments as the global rise in Ca2+ obscures the signal due to single TRPV1”. So it isn't clear why –40 mV was chosen, L–type calcium channel activity would likely be greater at –40 mV than –70 mV. Also –40 mV does not minimize the driving force when the calcium equilibrium potential is +120 mV. We thank the reviewer for alerting us to difficult-to-follow explanation in the original manuscript. We chose the holding potential for our experiments empirically, based on our recordings of isolated mouse dorsal root ganglion neurons. Using the same recording conditions as those used to examine TRPV1, we imaged Fluo–4 with 10 mM EGTA, but no capsaicin, at a number of different holding potentials. 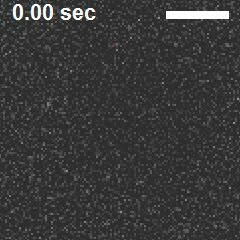 We found that holding at –40 mV produced the smallest rise in intracellular Ca2+ over the ten-or-so minutes needed for our experiments. We have now explained that more clearly in the text. Because isolated neurons have a host of natively expressed channels and we were able to identify conditions in which the Ca2+ leak was minimal, we did not attempt to assign the background rise in Ca2+ to any particular type of channel. In addition, the 10 mM EGTA should be capable of buffering global changes in cytosolic Ca2+. Furthermore, these recordings represent the first measurements of TRPV1 sparklets, and therefore a number of criteria should be fulfilled, e.g., quantal levels should depend on the calcium electrochemical gradient and not on the nature of the agonist or antagonist. TRPV1 agonists and antagonists should affect the probability of a sparklet but not the quantal level. We found that 10 mM EGTA was indeed very effective at increasing the duration of our experiments, and it is critical to observing micro-domains of Ca2+ sparklets since the on rate of Fluo–4 is higher than the on rate of EGTA, resulting in a localization and improved kinetic resolution of Ca2+ sparklet signal (Shuai and Parker, 2005). However, with extracellular Ca2+ at 2 mM, the high Ca2+ influx through TRPV1 will continue to saturate available EGTA and a Ca2+ gradient will form between the plasma membrane (where we collect our signal in TIRF) and the opening of the pipette (where Ca2+-bound EGTA diffuses out of the cell as Ca2+ –free EGTA diffuses in). This increases the free Ca2+ available to bind Fluo–4 or Fluo-5F, making it harder to resolve additional sparklets. In response to the reviewer’s question about quantal level, we now show collected data for sparklets from both dorsal root ganglion neurons and HEK293T/17 cells in new Figure 2D. The results of this analysis surprised us, because we expected the uneven position of the bilayer in the evanescent field would produce more variability than observed. The reviewer’s reasoning is sound, and now discussed in the text. We have done as the reviewer requested and improved the explanation of the tracking algorithm used in the text. Furthermore, we have analyzed the width of the Gaussian used to fit the sparklet/GFP position at each point, and used this value as a scaling factor for the size of the circles shown in new Figure 5C. This new analysis shows that the brighter fluorescence observed with sparklets compared to GFP did not reduce our ability to precisely determine the position of sparklets (uncertainty of ∼200-300 nm) within the context of a, relatively speaking, larger TRPV1 sparklet track ( ∼5-10 μm length). Thus, although the width of sparklet Gaussians was generally larger than that of Gaussians used to localize TRPV1- GFP, we were nonetheless able to combine GFP and sparklet localizations to plot single channel trajectories. Moreover, the mobility of sparklets analyzed in Figure 7 relies on the fluorescence of sparklets and not the fluorescent protein, which permits us to determine the change in displacements over the course of the movie. We believe this new analysis significantly strengthens the manuscript, and we thank the reviewer for his/her suggestion. See the response to Reviewer #2, question 2. Also, the activity- and Ca2+-dependent reduction in TRPV1 mobility was observed by following TRPV1–GFP in (new) Figure 6B as well as by following sparklets in (new) Figure 7. How well the mobility of a single TRPV1 channel tracks its activity is indeed a question of great importance. Although current methods do not allow us to directly address the mechanism by which Ca2+ influx through TRPV1 decreases TRPV1 mobility, we can answer the specific question posed by this reviewer. By recording the mobility of TRPV1-GFP in cells that are not voltage clamped and in which no Ca2+ dye is used, we can compare capsaicin in the absence of Ca2+ to capsaicin in the presence of Ca2+. As shown in Figure 6B, capsaicin only causes a decrease in TRPV1 mobility in the presence of extracellular Ca2+ (2 mM). We thank Mika Munari for expert technical assistance with the molecular biology and cloning, Dr Alexander T Stein for collecting the data shown in Figure 1—figure supplement 2, and Drs Manuel Navedo, Greg Horwitz and William N Zagotta for helpful discussions. Research reported in this publication was supported by the National Eye Institute of the National Institutes of Health under award number R01EY017564, by the National Institute of General Medical Sciences of the National Institutes of Health under award number R01GM100718, and by the following additional awards from NIH: S10RR025429, T32HL007312, and P30 DK017047. Animal experimentation: Many local labs generating transgenic mice have a surplus of wild-type littermates that are euthanized after phenotyping. We have arranged to be present during the euthanasia process and immediately take the carcass for harvesting of the tissue we require. These arrangements are consistent with the principle of reducing the total number of animals used in biomedical experimentation and are approved by AALAC and the University of Washington IACUC. All experiments were conducted in accordance with University of Washington Animal Protocol #3190-04.